IISD Reporting Services (IISD RS) has produced daily reports, daily web coverage and a summary and analysis of the meeting. To download our reports, click the HTML or PDF icons below. On Wednesday, July 11, while the Secretariat worked to produce revised documentation for Ramsar COP11, delegates went on field trips provided by their Romanian hosts to various wetland sites. Trips included: a tour of Bucharest; the Dumbraviƫa Ramsar Site; Comana Natural Park; Small Island of Brălia; Balta Abla, Amara and Jirlau; confluence of the Olt River; Middle Arges River floodplain, and Fusea Wetland; confluence of the Jiu River; Iezer Calarasi; Ciocăneşti; and mud volcanoes. Plenary will recovene on Thursday morning. 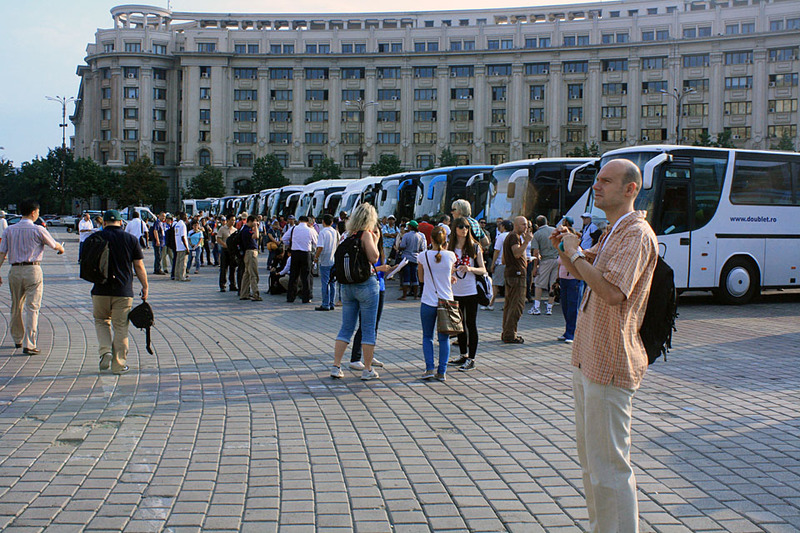 Crowds prepared to board buses for their field trips. A boardwalk through a wetland. A group followed tour guides through an area of large oaks near a wetland. Delegates chatted at the edge of a wetland. Herons looked for lunch in a wetland. Whiskered Terns looked for lunch while flying back and forth above wetlands. A frog in a wetland. A spider on its web in the forest. A bee on a wild strawberry blossom. The berries will be ripe in September. From a perch high on the tower, a small owl watched its new prey visitors. The ornate interior of the monastery's chapel. The twin domes of the monastery chapel. The abbot explained the monastery's history. Roses in the monastery's garden. A rural family traveling in a horse-drawn cart. The Argeş River in southern Romania. Balancing while using stepping stones to cross a flooded path. Relaxing on a Danube boat ride. The Danube River in eastern Romania. 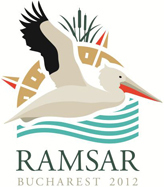 Ramsar is the Convention on Wetlands. Trams are the convention in Bucharest. The Palace of Parliament, venue for COP 11, stood ready for negotiations to resume.